In what I believe amounts to a mere 100th of a percent of the disability fraud problem, CNBC reports About 100 people accused in NYC disability scam. More than 100 people were rounded up and arrested Tuesday morning as part of a massive investigation into disability fraud in the New York City area, authorities said Tuesday. The alleged ringleaders, which included 83-year-old Raymond Lavallee, a former Nassau County assistant district attorney, and retired police officer John Minerva, surrendered to the Manhattan District Attorney's office, according to prosecutors. Approximately 80 additional police and firefighters, mostly from the tri-state area but some from as far away as Florida, also were arrested in the multiagency sweep that started at 5:30 a.m. Most of the police and firefighters arrested are former New York City workers, prosecutors said. According to the allegations, police and firefighters falsely claimed stress-related illnesses to pocket tens of millions of dollars in disability benefits. Many of the suspects also received 9/11 pensions, sources said. As the case unfolds with potentially more arrests, the fraud dollar amount could rise even further, authorities said. The Manhattan DA's office also released pictures of several suspects, who received hundreds of thousands of dollars in benefits. 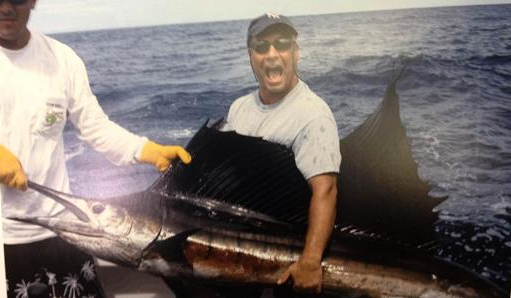 In one picture, a man named Richard Cosentino is seen on a boat and swordfishing. He received $207,639.70 in payments, according to prosecutors. Another image shows Louis Hurtadoin inside a martial arts photo. He pulled in $470,395.20, prosecutors say. And in yet another photo, a man named Glenn Lieberman is sitting on a WaveRunner, with both middle fingers raised, smiling into the camera. He received $175,758.40 in benefits, according to prosecutors. A spokesman for the NYFD union declined to comment. At best the union will choose not to respond. More likely, the union will protest the arrests when the story dies down, just as unions protect child molesters in LA and New York. Please check out the above link, it's really quite amazing.